We produce for Italy and abroad decotablet silicone molds to decorate a handmade gelato tub. 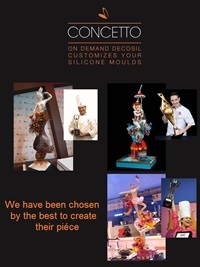 Italian leaders of silicone moulds, we create and sell for over 10 years decotablet silicone molds to decorate a handmade gelato tub, food safe silicone moulds worldwide to confectioners, bakeries and Delicatessens. decosil® decoTablet allows you to get in a easily and simply way decorations for your handmade gelato tubs, making them irresistible to young and old!